In the lead up to the fast approaching exam period The Sir Duncan Rice Library will be extending its opening hours to 24 hours a day, 7 days a week. There are just a few days until this happens and we want to let you know just now so that you can properly plan your revision. 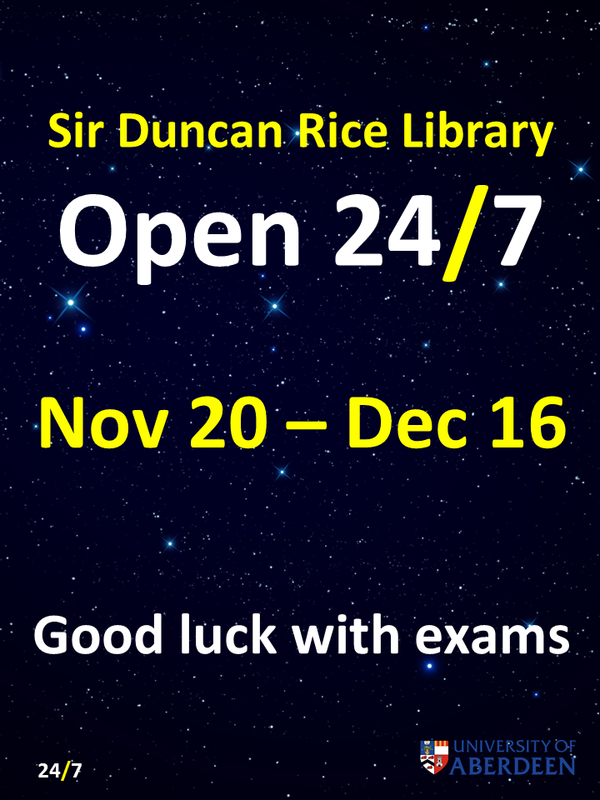 The Sir Duncan Rice Library will open at 11.00 on Sunday November 20, and stay open continuously until 22.00 on Friday December 16, 2016. Swipe access only after 22.00 – please ensure you have your ID card, as access will not be permitted without it. The PCs require a nightly shutdown (lasting about ten minutes) and reboot for essential maintenance. This will happen at 04.00, and you will be given an option to delay this for 2 hours. Essential cleaning of the building will be carried out overnight between 02.00 and 06.00, which may result in some disruption. Look after yourselves and your belongings – take breaks, but do not leave your personal belongings unattended. Take care if leaving the Library in the early hours – travel with friends if possible. Hot and cold drinks in covered containers can be consumed in designated areas of the Library (everywhere except the silent study areas, study rooms, project rooms and areas with equipment). Cold food can be consumed in the same locations – but not if it is has a strong smell or is noisy! (remember – no hot food allowed). Tidy up after yourself – use the bins which are available on each of the floors. Keep talk to the group study areas to allow others to study. Floor 1, TSDRL) or by phone (01224 273330). Also check out the opening hours for our other two Library sites, as Taylor and Medical will not be open 24/7 during these dates. If you have any feedback or suggestions, contact us at library@abdn.ac.uk.